Basketball is one sport that I don't really understand. I think it's boring, sweaty, and squeaky... from the viewer's perspective. From the player's perspective, I think it's hard and too fast-paced. Yes, I played basketball. For about two weeks. My brother did, too, for a different team in his age group. I was in sixth or seventh grade, and one of my friends' dads was the coach of my team (although my friend didn't play, her older brother did). At the second practice, the coach told me that I should go to the library and check out a book to learn how to play. I was really frustrated with this, and didn't understand why he wouldn't cover the basics with the team (although, admittedly, I was the only remedial player). So, I quit. And, coincidentally, never really learned how the game works. 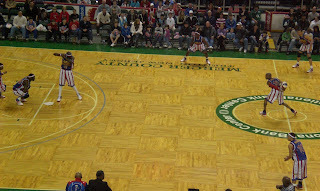 But, when the Harlem Globetrotters play, rules and strategy don't matter, so I had a great time. Jonathan also thought that their performance was very good. I'd recommend it to most people, as long as they enjoy a good show. 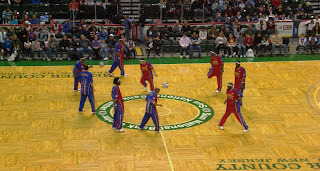 The premise of a Harlem Globetrotters event has two parts, really. First, they win in a game against the fictitious Washington Generals, who cheat. 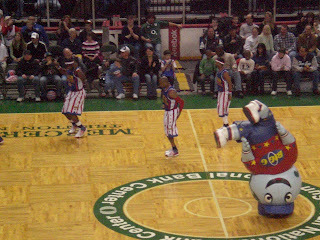 Second, the Globetrotters' mascot, Globey, does crazy things during timeouts and between quarters (which are quick ten-minute stints here). I like the mascot parts better, but all of the musical interludes even make the basketball part pretty good. 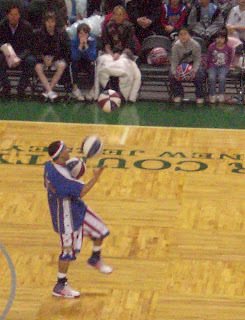 And, let's not forget, the Harlem Globetrotters are known for fantastic ball-handling tricks, so that certainly enlivens the show. For about two hours, ball-twirling, creative passes, and crazy mascot antics kept us quite entertained. Even the time between the halves was filled with audience-oriented activities, and it was fun to see so many happy children. 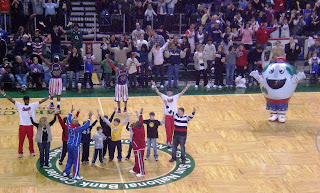 I took a bunch of photos, and have included some of the neat ones below... players first, then mascot-based activities. some passing the Cupid Shuffle. the mascot is even doing the kicks upside down!! 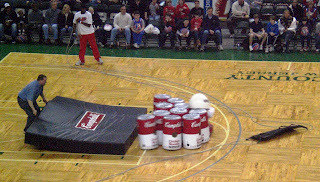 YMCA Globey breaking it down here, you can see Globey hitting some Campbell's soup cans. it was a bowling-type event, and he was bungeed into them, haha.